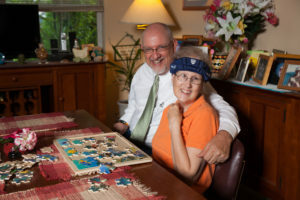 Mike Cornelius cares for his wife Carol at their home in Tampa during the 120-plus hours a week that Carol’s Medicaid HMO does not provide in-home care through Florida’s Medicaid Waiver program. 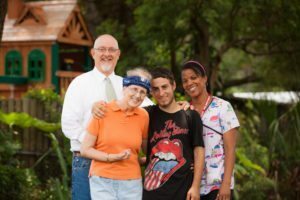 The HMO had cut Carol’s in-home care from 45 to 33 hours per week saying that it was not responsible for providing care as a “convenience” so that Mike could work, but Florida Legal Services Inc. stepped in and got the Agency for Healthcare Administration to renounce HMO policies that deny services based on a family member’s work schedule. For three years Mike Cornelius had run a daily race from home to his full-time job and back again so he could to take over from his wife Carol’s caregiver, but on April 8, 2014, he got a letter from Carol’s Medicaid HMO saying that it was reducing her care from 45 hours a week to 33, turning his exhausting routine into an impossible feat. “Even before the decrease in hours, I was running absolutely crazy,” said Mike, whose life had been upended in June 2010 when, on the last day of school, his 12-year-old son Myles came home from the park in his quiet Tampa neighborhood to find his mother unconscious on the floor. Carol Cornelius had two brain surgeries in the next 12 hours and spent two weeks in intensive care. She finally made it home by Thanksgiving, but the Carol who came home was not the one who’d fixed an after-school snack for Myles and sent him off to the park five months earlier. Carol, now 60, has to have an alarm on her bed and chair in case she tries to stand up and walk, as she doesn’t understand she is paralyzed on the right side. She tries to have a conversation with a visitor, “but she can’t,” said Myles, who since the age of 13 has been providing, along with Mike, the more than 120 hours a week of his mother’s care the Medicaid HMO doesn’t cover. Mike, Carol and Myles Cornelius consider Carol’s caregiver, Wendy Garcia, a member of the family. She stayed with them even after Carol’s Medicaid HMO cut Carol’s care hours. “He’s given more care to his mother than his mother has ever given him,” Mike said. In fact, it was based on “what you and your family are able to do” that the HMO said it was cutting Carol’s hours. In an appeal hearing, the HMO testified that it was not responsible for providing care for the “convenience” of a family member so that he could work, or look for work. The appeal was denied. He turned to a private attorney, who referred him to Florida Legal Services Inc. (FLS) in January 2015. 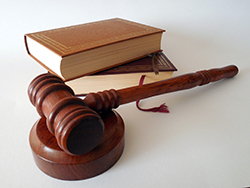 FLS reviewed other long-term-care hearings and found similar outcomes. FLS, whose funding comes primarily from The Florida Bar Foundation, filed a brief with the Second District Court of Appeal challenging the legality of equating a family member’s employment with “convenience” and of the Agency for Health Care Administration (AHCA) allowing contracted Medicaid HMOs to set such policies, which are supposed to be under the purview of the agency itself. 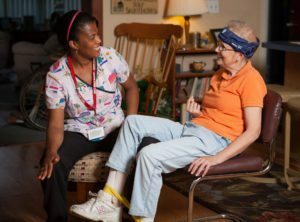 Wendy Garcia, Carol Cornelius’ in-home caregiver, puts Carol through her exercise routine. Beyond helping the Cornelius family, Huddleston and fellow FLS attorneys Kathy Grunewald and Anne Swerlick wanted to set a nationwide precedent to force state agencies to take responsibility for unlawful actions and policy pronouncements of HMOs participating in Medicaid Waiver programs, which are designed to allow the elderly and disabled to live at home instead of in an institution by providing cost-effective services. Olga Bzdyk, an 82-year-old widow with end-stage Alzheimer’s, was another such person. Her daughter, Karen, had taken care of her at her Miami home for six years while working 60 hours a week, but Karen reached her breaking point after herniating two discs trying to lift her mother and running out of money for in-home care when she couldn’t be at home. The same Medicaid HMO that had cut Carol Cornelius’ hours capped Olga Bzdyk’s at 58 hours a week, which was not enough to allow Karen to maintain her job, much less go to the grocery store or pharmacy or conduct the routine errands necessary to take care of herself or her mother. In Bzdyk’s case, FLS not only represented her before the Third District Court of Appeal, but it also filed a Petition to Initiate Rulemaking, formally asking AHCA to adopt a rule that prohibits HMOs from denying services based on a family member’s job. In November 2015, AHCA issued financial sanctions against the HMO over its handling of the Bzdyk case and announced its renunciation of HMO policies that base medical necessity on the work schedule of an enrollee’s family member. 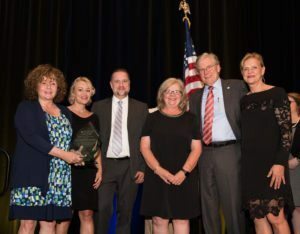 (from left) Cindy Huddleston, Lea Remigio, Chris Jones and Kathy Grunewald accepted the Steven M. Goldstein Award for Excellence from Bill Van Nortwick and Maria Henderson at the Foundation’s 40th Annual Reception & Dinner June 16 in Orlando. Van Nortwick and Henderson sponsored the Goldstein Award along with their firm, Akerman LLP. For their work, the FLS attorneys received first place in The Florida Bar Foundation’s Steven M. Goldstein Award for Excellence, which recognizes a project of significant impact work undertaken by a grantee of its Legal Assistance for the Poor grant program. 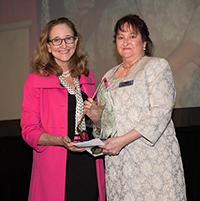 The award was presented at the Foundation’s 40th Annual Reception & Dinner June 16 in Orlando and comes with $25,000 for Florida Legal Services to use at its discretion, plus $3,000 earmarked for staff training. Huddleston said it’s important now to get the word out that AHCA has set the new policy. “There are a half million people just with Alzheimer’s in the state now,” she said. Mike Cornelius is pleased to have been involved in a project that is helping others, but he admits that he went into the fight for his own family’s survival and to keep his wife out of a nursing home, where he feared she’d become catatonic.